It’s common knowledge that rural crime is on the increase and tack shops livery yards are on the ‘hit list’. Some of the most recent incidents, that include large hauls of horse tack, have been reported in the Northamptonshire area by the Horse Watch Alliance. Banburyshire farms and livery yards were deliberately targeted in a night of burglaries during which more than £100,000 worth of horse tack was stolen. Thieves took a Green Mitsubishi pick-up truck from a farm in Heythrop on Sunday which they then used to ram through a fence and a hedge at Paradise Farm in Wigginton, where they stole a black Ifor Williams trailer and filled it with £65,000 of worth of horse tack including saddles, bridles and head collars. They then went on to steal a further £10,000 of horse tack and two Segways from a third yard nearby before stealing five wheels worth £1,000 from a fourth farm in the Chipping Norton area. With the rise in incidents across the country Datatag ID Limited, the proven number one anti-theft deterrent is fighting back. 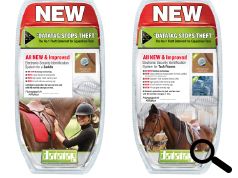 Datatag launched two new anti-theft systems for the equine market at the end of 2012. The first system protects a single saddle and the second system is a complete tack marking system protecting, three saddles and other items of tack. The saddle systems use Datatag technology with a unique electronic transponder fitted inside each saddle, with a high quality metal stud attached to the outside of the saddle which acts as a powerful deterrent against theft. 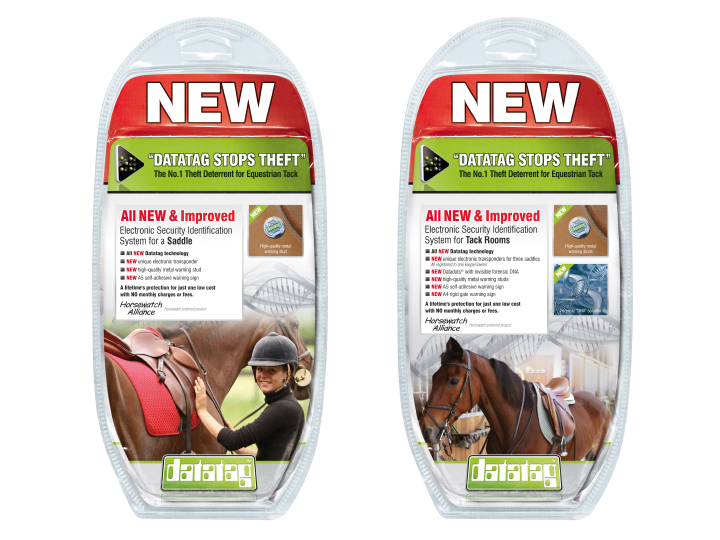 The tack room kit will safeguard three saddles and also includes Datadots with invisible forensic DNA to mark other items of tack. All systems also include A5 self-adhesive warning signs and the tack system includes an A4 rigid gate warning sign. Datatag is the only proven scheme of its type in the world. Datatag is already a house hold name in construction and agriculture as the power behind CESAR, the only official equipment security scheme, fitted as standard by JCB, John Deere and Massey Ferguson amongst many others.